Economist David A Green, a professor and former chair of the Vancouver School of Economics at UBC and an International Fellow at the Institute for Fiscal Studies in London, conducted a thorough review of academic research on the economic impacts of minimum wages, and in this report he concludes that bold increases to the minimum wage make good economic sense. (Vancouver) In the wake of the BC government’s shockingly low 20-cent increase to the minimum wage, a new report suggests that such small changes fail to adequately reduce poverty and inequality, and are unnecessarily timid. 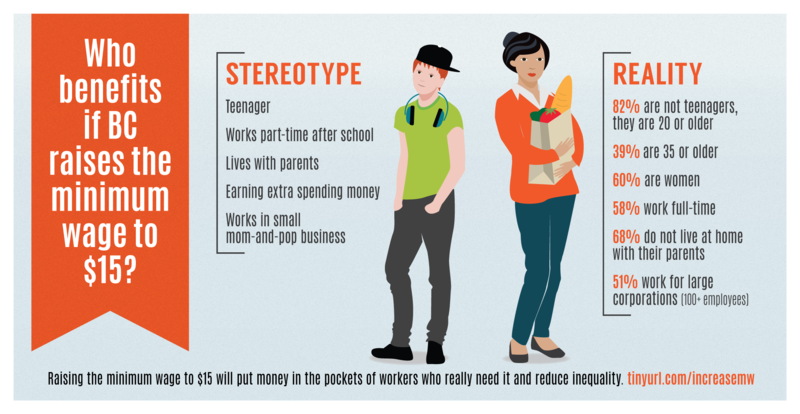 Infographic: Who benefits if BC raises the minimum wage to $15?